The Canadian Diabetes Association estimates that currently one in four Canadians have diabetes or pre-diabetes and that this number may rise to one in three by 2020. I am fortunate to work with registered dietitian Deb Lounsbury, who is a certified diabetes educator, and over the past 25 years, has worked in areas such as diabetes, cardiovascular health and obesity management. She helped me clarify some of the most common myths about nutrition and diabetes. Myth No. 1: Diabetes is about avoiding sweets and sugar. FACT: Diabetes is about managing carbohydrate intake. “There is nothing you need to avoid; all foods can fit even if you have diabetes” says Lounsbury. The key in diabetes management is spreading out food throughout the day so your body can handle a reasonable amount of carbohydrates at one time. If you have just been diagnosed with Type 2 diabetes, Lounsbury suggests limiting obvious sugary foods such as pop, fruit juice, candy and sweets to get your blood sugars under control. Once blood sugars are better managed, she works to help people understand how to occasionally incorporate foods such as desserts. Lounsbury also emphasizes that carbohydrates can still be enjoyed by diabetics. “Diabetes is about managing carbohydrate intake, not simply about limiting sweets, potatoes, pasta and bread.” Many of her clients are surprised that carbohydrates are found, not just in sweets and grains, but in milk, yogurt, fruit, juice and corn. Myth No. 2: I must eat six times per day. FACT: Eat every four to five hours. While so-called grazing has been suggested to be helpful for managing blood sugars, be aware that not everyone needs to eat every two hours. Snacking constantly may contribute to excess calories and weight gain, which doesn’t help diabetes management. Lounsbury suggests eating every four to five hours and dispersing carbohydrate-rich foods throughout the day, in addition to taking diabetes medication as prescribed by your physician. Myth No. 3: A special diet must be followed. FACT: You can eat regular foods like everyone else. Lounsbury finds many of her clients are relieved that they don’t have to eat a separate meal from other members of the family. You can buy regular food at the grocery store and cook regular recipes. While you can certainly lower the sugar levels of recipes, use diabetes cookbooks or buy sugar-free foods, this isn’t mandatory. While the type of food you eat is important for health, when it comes to healthy blood-sugar management Lounsbury emphasizes that often “portion sizes are just as significant as the type of food eaten.” For example if you had the choice between baking your favourite regular sugar muffin recipe or trying a lower sugar muffin recipe, the most important consideration is limiting yourself to one at a time regardless of the choice. Myth No. 4: Low glycemic foods are best. FACT: Portion sizes are still important. The glycemic index is a scale that ranks carbohydrate-containing foods by how much they raise blood sugars. A low glycemic food goes into the blood stream slowly and therefore is often advocated for those with diabetes. The most significant thing to be mindful of is the portion size of the carbohydrates. Although each person is very different, Lounsbury offers a general starting place of keeping the grains and starches portion of the meal to be about one-quarter of the plate or the size of your fist. Also be sure to balance out the meal with protein and vegetables. Myth No. 5: Alcohol always raises blood sugars. FACT: Alcohol could lower blood sugars. Alcohol can have variable effects on blood sugar and should be something you speak with your certified diabetes educator about. Some alcoholic drinks, such as sweet coolers, dessert wines and hard liquor mixed with juice or pop, may contain high levels of sugar and could be exceptions, but alcohol itself can lower blood sugars. It is therefore advised that when you drink alcohol you should do so in moderation and also consume a carbohydrate containing food. Myth No. 6: I must consume alternative sweeteners. FACT: Alternative sweeteners are a choice but certainly not required. 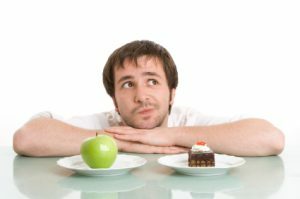 Some individuals will choose to consume foods such as diet beverages, sugar-free sweets and diet yogurt. Should you choose to consume these you can refer to the ADI (acceptable dietary intake) set up by Health Canada and information from the Canadian Diabetes Association for alternative sweeteners such as aspartame and sucralose. As a foodie and advocate for consuming real food (the stuff that grows on trees, in the ground and has ingredient names on packages your kids can easily read), I prefer the approach of quality over quantity. You can bet if I hosted guests with diabetes I would much rather serve small pieces of yummy homemade cake made with ingredients my grandma would recognize.